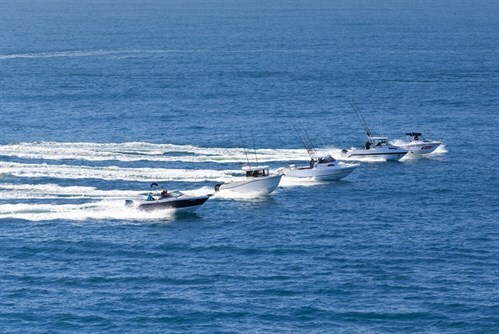 Familiarise yourself with the 10-point scoring system used to test and rate the best fishing boats in the Australia's Greatest Boats comparison. Ever since Australia's Greatest Boats first took off in 2010, all boats have been rated and compared using a standard set of criteria. Many misconceptions exist around how to be invited to compete and even how to win. The reality is simple: when we review the best trailerboats throughout the year, our writers give each a rating based on the very same criteria used to judge Australia’s Greatest Boats. Towards the end of the year, we count the scores, and the top five in each category of aluminium and fibreglass fishing boats get an invite. If a boat is unavailable, like last year’s Whittley, the next boat in line scores the invite. No one is invited for any other reason than merit. Each boat also needs to have been tested in the 12 months prior. This means the same boat cannot be entered twice, as we don’t re-test the same model more than once. Winning is simple – impress the five judges with the best score across 10 criteria and there is a good chance that boat will enter a very elite group – Australia’s Greatest Boats, winner. 1 Suitability for intended purpose. How does the boat perform in its intended purpose? A score of 1-2 would mean the boat is entirely unsuited for its intended purpose. A score of 9-10 would mean the boat is class-leading for its intended purpose. What is new or different about this boat? How original are the innovations? How well do they work? A score of 1-2 would mean the boat is lacking in innovation. It is tired and unoriginal. A score of 9-10 would mean the boat has industry-leading innovations and uses superb and/or highly original ideas. Does the boat have good design and layout? Is the boat visually appealing? Consider its access, storage, instrument layout, service accessibility, deck area, gunwale height, size of fuel tank size, fit-out, etc. A score of 1-2 would mean the boat is badly designed and poorly laid out. Crucial areas are difficult or impossible to reach, storage is minimal or non-existent, gunwales are the wrong height, instrument area is difficult to see or inadequate, etc. A score of 9-10 would mean the boat is superbly designed and has an ideal layout for its intended purpose. It has easy access, spacious storage, extensive and easy to see dash, is visually appealing, etc. How do the fibreglass mouldings / weld quality rate? What is the upholstery quality? The paint and deck surfaces? A score of 1-2 would mean the finish on the boat is obviously substandard, the production process is clearly rushed, little or no thought and care has gone into the quality of materials. A score of 8-10 would mean the quality of the finish is meticulous, the highest quality materials are used, extensive thought and care is evident in the finish. How responsive and predictable is the hull? How soft is the ride? How dry is it? A score of 1-2 would mean the boat hits hard, turns poorly, and may be unnecessarily wet. A score of 9-10 would mean the boat performs extremely well, offers a soft ride, and remains relatively dry. How stable is the boat at rest? How well does it handle shifting weight? A score of 1-2 would mean the boat is unpleasantly or even dangerously unstable for its intended purpose. A score of 9-10 would mean the boat is as stable as boats get for its intended purpose. What is the quality of the helm layout? The availability and positioning of seating? Windscreen height and protection from the elements? Ease of anchoring? Access to cabins, storage, bait tanks, iceboxes, rod storage, ski/wake accessories etc? A score of 1-2 would mean the boat is noticeably awkward, uncomfortable, and strenuous in its intended use. A score of 9-10 would mean there is barely a hint of discomfort and is as comfortable as a boat gets in its intended purpose. 8 Standard equipment including safety features. How does the selection of standard items rate? What is the quality of standard items? What proportion (if any) of standard items are typically considered options? A score of 1-2 would mean the boat is either lacking in rudimentary standard features and/or has equipment that is of very poor quality. Safety features may also be dangerously flawed or lacking. A score of 8-10 would mean there is an abundance of standard equipment including equipment that is often regarded as optional. All items are of high quality, and the boat is inherently safe. Does this boat give punters what they pay for? Does the boat hold its resale value? A score of 1-2 would mean the boat is significantly overpriced for what it is, has flaws that will likely result in ongoing costs, has poor resale value, etc. There are many competing boats on the market that represent better value for money. A score of 9-10 would mean the boat is priced extremely competitively, has superb resale value, has reasonable (or even non existent) maintenance costs, etc. There are hardly any (or even none at all) boats that can match this boat’s value for money. What are the tester’s personal sentiments on the boat? What does the tester feel its future may be? What is the WOW factor? A score of 1-2 would mean the boat is uninspiring, and ultimately lacking in appeal and marketability. A score of 9-10 would mean the boat offers an excellent combination of all elements but somehow adds something more that makes you go WOW!